Dacsee is a ride-hailing network that aims to turn the ride-hailing concept into a community-run enterprise. The platform came as a response to the concerns towards current ride-hailing players; riders want more accountability, while drivers want more control over their customer-base and money. The company uses blockchain to keep their transactions transparent. Drivers can build their own fleet using a system modelled after MLM. Grab and Uber have built a pretty substantial presence here in Malaysia, thanks to immense support from Malaysian regulators. As we wait for something like Lyft to finally come here, another player enters from left field. Dubbed Dacsee—short for Decentralised Alternative Cabs Serving & Empowering Everyone—this network is doing things a little differently. “We’re focusing on the supply side (drivers) first, and then the demand side (passengers),” said Alexander Von Kaldenberg during their announcement yesterday. It has been said that this platform could potentially help the taxis in Malaysia. There have been other platforms like Delicab and ZeppOn, though Dacsee has a few features that made us sit up and take notice. Firstly, they’re not charging the typical 20%–25% commission rate charged by its contemporaries. Instead, the Dacsee e-wallet will only take 1–2% commission fee from a driver’s wallet. Secondly, there is an incentive structure that rings similar to the MLM system. Dacsee first came to be in Thailand last November. On the platform, users can pay either using cash, credit or debit card. Its aim is to use a decentralised ride-sharing platform to help both riders and passengers, without keeping authorities out of the loop. Your vocabulary word of the day: Decentralising means transferring responsibilities from one central authority and delegating it to individuals or units down the line. This is how decentralising applies to Dacsee’s business model. The ride-sharing system won’t be earning money from driver commission fees nor passenger bookings, as stated in their launch. Instead, they seemingly came into the market as a response to the ride-sharing giants of today. At the same time, they state that drivers’ income is unsustainable because they don’t own the customer base, which is usually controlled by the parent company. A lenient driver screening process also leads to some issues of safety. Dacsee’s solution to these problems? Firstly, riders can actually choose which drivers they prefer from past trips. Trips will also be monitored in case of safety issues—not by Dacsee themselves, but the fleet of Dacsee community nearby. The community-based screening doesn’t end at safety and customer-onboarding. It also applies into driver-acquisition. For that whole “unsustainable bubble” problem, Dacsee attempts to fix it by using a system modelled after MLM. Drivers are encouraged to recruit drivers to create a fleet under them. The fleet will be limited to three levels down. With every successful trip by your fleet, a portion of the commission goes into your wallet. This is where the “MLM” portion comes in. The more drivers that you bring under you into Dacsee, the more you stand to earn. Dacsee has even said that they allow drivers to pass their “empires” down to their kids. That being said, this seems to be where the similarities with MLM end. As mentioned, the fleet-under-fleets are limited to three levels down. Not to mention, the incentive only constitutes between 1–2% of their revenue model, whereas with many MLMs, the best-grossing task is to induce people into the system. Not to mention, transactions will be transparent and available, recorded through blockchain technology. They’re piggybacking off Ethereum’s blockchain to develop their own; this helps them distribute the recruitment incentives and keeps things clear for the bosses that need to regulate this stuff. The 1–2% commission will be given to drivers and referees using Dacsee Tokens. 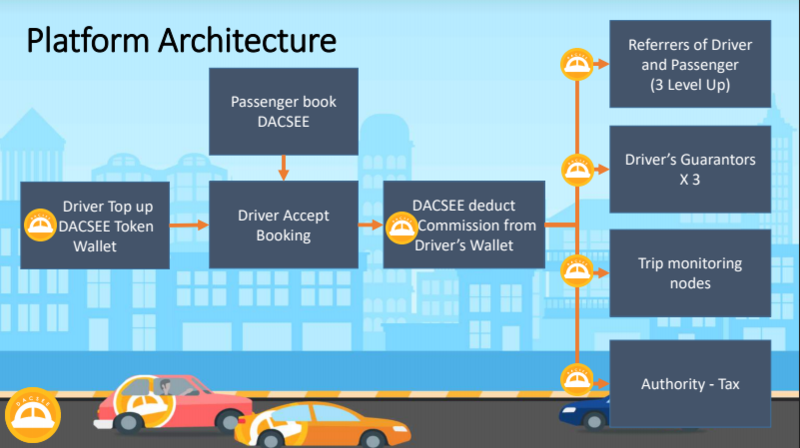 For those who know about cryptocurrency, the Dacsee tokens are decentralised “Ethereum ERC20 token that customers will use to pay for taxi rides in a cryptographically-secured, unstoppable fashion”. The tokens will be distributed automatically through the Ethereum network, and can be accessed through the Dacsee Wallet App in Google Play Store (though we could not find this upon our own search, maybe because it hasn’t been activated in our region yet). The tokens can be changed into normal cash using any authorised cryptocurrency exchange. The team behind Dacsee decided to use blockchain so that all their transactions are kept transparent. After all, the team insists that Dacsee is community-run. 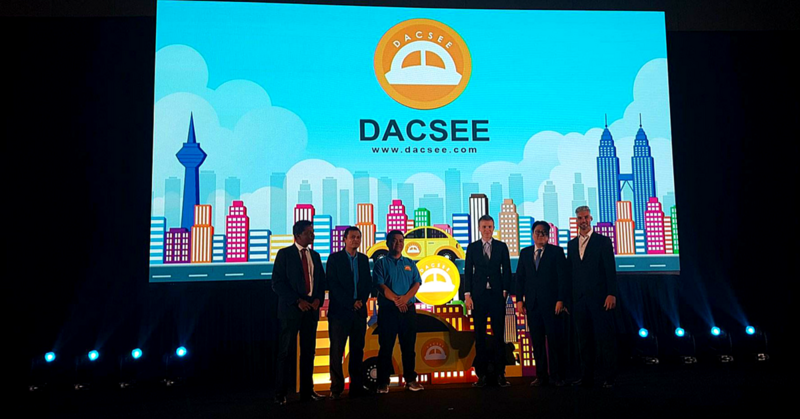 Dacsee’s entry into Malaysia marks an interesting marriage between the current hotly debated cryptocurrency, and the equally discussed ride-hailing apps. It is clear that the platform came in as a response to some of the gripes had by drivers about their income, and riders about safety. Taxi drivers might also finally be able to see disruption that might benefit them. The network now has 5,000 registered drivers, which proves interest among the community. That being said, these are all very lofty goals. The idea behind a community-run platform is indeed appealing. But we do have our concerns about the system imploding from within. If unscrupulous players begin entering the system, one rotten egg to spoil the whole bunch. At the very least, Dacsee has clear intentions to suss everything out with the local authorities before going live next month (the stated launch date will be in April). Would this be an idea too lofty to carry itself? Or is it just outlandish enough to work? Only time will tell if they will become viable disruptors for the disruptors themselves.